Logging in to the databar. Displaying the ASE graphical user interface on your laptop. Forward a connection to the Jupyter server (SSH tunnel). Accessing files on the remote server from your laptop. You download the program from the website https://mobaxterm.mobatek.net. Choose Download, select then “Free Home Edition”. You are now given a choice between a “Portable Edition” and an “Installer Edition”. The Installer Edition is installed like any other Windows program; the Portable Edition comes as a ZIP file that you need to unpack. The program is then in a folder together with a data file, and you can run it from this folder. We have no reason to recommend one version over the other, it is a matter of personal taste. Start MobaXterm. You will see a window with a row of buttons at the top. Click on the Session button, you will now see a window as shown below. 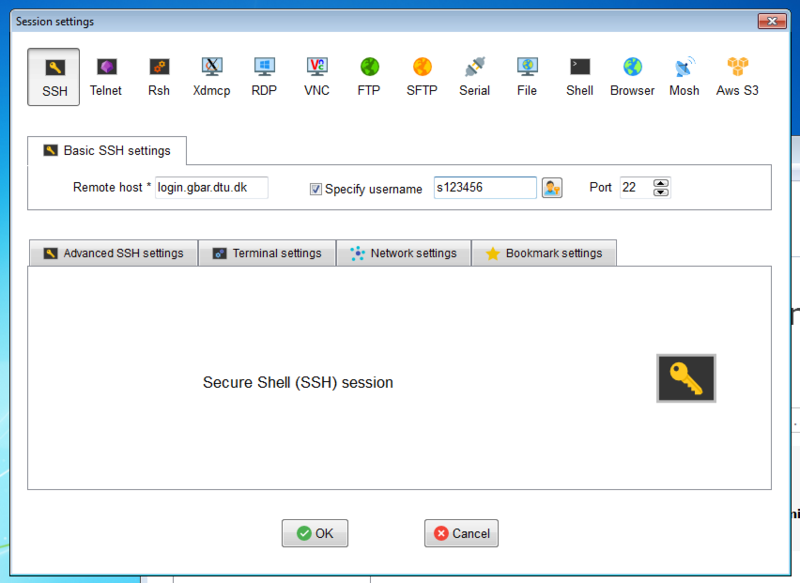 In the tab Basic SSH settings you should choose Remote host to be login.gbar.dtu.dk. The user name is your DTU user name (external participants got it in the registration material). The port number must remain 22. Click OK and give your DTU password in the text window when prompted. NOTE Nothing is written when you type the password, not even stars. We do not recommend allowing MobaXterm to remember your password! 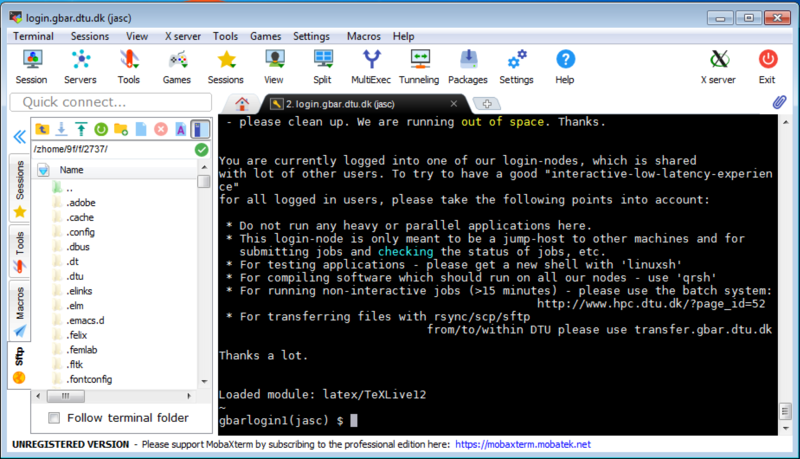 You now have a command-line window on the DTU login-computer, as shown below. The two last lines are the command prompt. The first line indicates your current working directory, here your home folder symbolized by the ~ (tilde) character. The lower line gives the name of the computer (gbarlogin) and the user name (jasc in the figure) followed by a dollar sign. (the last X is a capital X, you get no error message if you type it wrong, but the ASE graphical user interface will not work).